Photos courtesy of TLC PhotographyA large sprayer sits on the floor for producers to examine. The 46th annual Triumph of Agriculture Exposition, held at the CenturyLink Center in Omaha, Neb., took place on Feb. 29 – March 1, 2012. 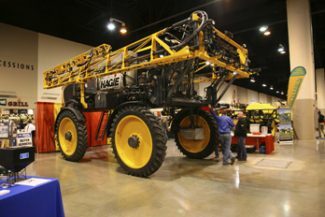 The show is the largest indoor shortline farm machinery show, and offers speakers, hands-on demonstrations, and product information on farming supplies to area producers. Bob Mancuso, Jr, Director since 2005, answer questions about the show. My dad – Bob Mancuso, Sr. started our company back in 1965. This was one of his first shows and has been on every year since it started. The show was originally held at the Omaha Civic Auditorium. The CenturyLink Center was opened in September of 2003. Our Omaha Products Show for Business and Industry was the first show in the new center. The Triumph of Ag was moved to CenturyLink in March in 2004. Now it is known as one of the last shows in this area – before the farmers and ranchers start to get ready to get in the fields for planting. Our company plans and puts on the event. We work with a lot of groups to help it be successful. 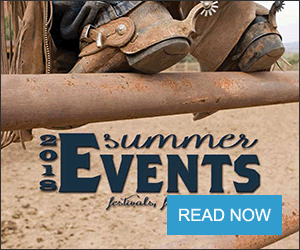 We work with the Triumph of Ag Expo Council members, who represent the industry and our show. We also are members of and work with the Omaha Agri-Business Club and the Chamber of Commerce Ag Council. Our show is also a member of the North American Farm Show Council, which is the top 25 shows in the North America. We are a charter member. There are over 650 exhibiting companies and over 1,000 displays. The show is one of the largest events and shows at the CenturyLink Center Omaha. We had shortline farm equipment, all types of tractors, sprayers, tillage, seed, construction, trucking, storage, GPS, crops, cattle and livestock equipment. Really, we had all types of equipment, services, and technology for the farm and ranch. The attendees are farmers and ranchers that are looking at all those types of needs and wants for their farms and operations. We had seminars throughout both days, on very diverse topics. They included family succession, planning for the farm, 2012 weather forecasts and what to expect this year in weather, beginning farmer programs, tax planning and estate and retirement and specifics on equipment and new products. Why is the show held when it is, and why do you hold it in Omaha? The show is held right before the farmers and ranchers get in the fields. A lot of the farmers and ranchers can make an easy trip to Omaha. The show draws from the surrounding seven states and especially from the 200 mile radius around Omaha. So you hit lower South Dakota, Western Iowa, Eastern Nebraska, Northern Kansas, and Northern Missouri. Farming today is more challenging and Midwest farmers are interested in keeping up with the changes and ways to increase their profits and yields per acre while reducing their costs. The farmers and ranchers have been doing very well the last few years. 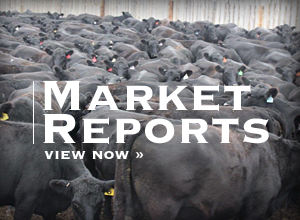 The crop prices have been up and their land values are up. When the Ag community is doing well, it has helped other areas and that is one reason the Midwest has been doing much better during the last few years. The winner is selected each year from nominations to our Ag Council. We then work with community leaders, some of the local Ag groups, and past award winners to select the winner. If you look at a list of the previous winners, it is a who’s who of people who have really contributed so much to Ag in Nebraska, the nation – and the world! The show went very well and many exhibitors sold equipment right on the floor and had sales right at the show. Many had great new leads to get them started for the year and to start the year on a strong note. I really enjoyed our Opening Luncheon this year. We had members from the Omaha Agri-Business Club, members from the Greater Omaha Chamber of Commerce, other Chambers from Iowa and Nebraska, and people from the community. We heard from our Agri-Award Winner, Greg Heckman, President and CEO from the Gavilon Group, Miss Rodeo Nebraska – Sierra Peterson, and from Congressman Lee Terry’s Chief of Staff, Mark Anderson. He gave us an update on the Keystone Pipeline issues and a farm and ag review. Next year – the show is scheduled for March 6-7, 2013 at the CenturyLink Center. So we are already building our plans and timeline.